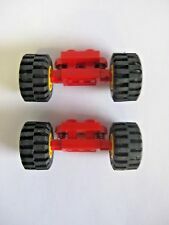 Lego lot of2 pcs of TechnicShock Absorbers - Light Bluish Gray, 6.5 stud length. Parts will be enclosed in a zip-lock bag. Lego new Pearl Dark Gray Shark with Bones and Gills with White Eyes with Dark Tan Sinew and Teeth Ghost / Zombie Pattern,Complete Assembly still in Lego Sealed factory clear bag that was sorted out from Pirates of the Caribbean Silent Mary Set #71042. Picture stands are not included. Light wear. I Wont send you a bunch of 1x1s and 1x2s and claim a high piece count. If that's what you are looking for I have small pieces in a separate sale. I will make it right! In Good Played With Condition. Lego 6222 Brick, Round 4 x 4 with 4 Side Pin Holes and Center Axle Hole and is Dark Bluish Gray in color. Parts are in real good condition. Pictures are of actual item (baseplate not included). 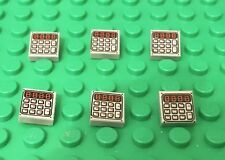 Lego X10 Pieces new Light Bluish Gray Tile 2x2 Modified with Bar and Stud with Stop Ring Parts lot. LEGO new x15 pieces Dark Bluish Gray Plate 10x10 Octagonal with Hole and Snapstud (part #89523). 63 pcs Gray Flexible for sets 3677 7938 7939. Any item is eligible for local pick up. This also applies to combined orders. This item is used, but in GREAT condition. Lego X25 pieces new Light Bluish Gray also known as medium stone Gray Hinge Plate 1x4 Swivel Top / Base Complete Assembly bulk parts lot,to get combined shipping make sure to request a new total before payment,thank you. Lego X25 pieces new Dark Bluish Gray Cutlass Sword / Pirates / Castle Mini Figures Weapons bulk parts lot,to get combined shipping make sure to request a new total before payment,thank you. In good used condition. Lot includes:4 light stone grey, 3 white, 2 dark blue, 2 dark stone grey, 3 blue. We're easy to work with; communication is key. Large lot of 140 Lego castle pieces from a variety of sets. 140 Lego Castle Pieces Gray Black Brown. You are buying ten Lego 3x4 Dark Stone Grey Wedge Plate with cutout bricks. These bricks are fresh from the box/bag and in mint condition. Each lot includes a random mix of 50 old dark gray sloped bricks. In good used condition! Includes standard and inverted slopes in a mix of sizes. Actual mix of pieces may vary a bit from lot to lot based on availability. Lot of 100 total Lego pieces. Lego X10 New Dark Bluish Gray Container Crate Box / Street Trash Can Bulk Lot,for combine shipping charges please request a total before payment,thank you. Lego 25 Pieces New bulk parts lot Light Bluish Gray 1x10 Brick / Medium Stone Gray Building Bricks,for combined shipping please request a new total before payment,thank you. This sale is for the new lego pieces show in the picture. BUILD BONANZA Block Peel & Stick Tape Works with LEGO's awesome!!!! Lego lot of 8 cell walls, used in good shape. Get the exact lot pictured. Check out my other listings for way more lego lots. I list new stuff all the time. Z-712. Lego Huge Technic Wheel- 75mm x 17mm size rim. -black rubber tire with Dark Gray rim. Lego new Light Bluish Gray Frame 1x4x6 With Door With Stud Handle / Home Building Parts,to get combined shipping make sure to request a new total before payment,thank you. Lego X6 new Light Bluish Gray Door Frame 1x4x6 With Barred Door / City Police / Star Wars Parts lot,to get Combined shipping make sure to request a new total before payment,thank you. For sale is A Lot Of 50 Dark Bluish Gray Flat Tiles 1x2 Smooth Finishing Tiles. Genuine and authentic LEGO.